Psychologists and physicists often use a similar term to describe one of the most fundamental characteristics of humans and matter: The Story. 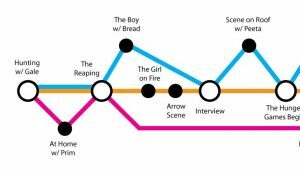 Here, for example, is the timeline story for key events in the movie The Hunger Games. Oliver Sacks, in his book ‘The Man Who Mistook His Wife for a Hat’ describes the case of Jimmy G who was afflicted with Korsakov’s Syndrome. He could not remember events more than a few minutes in the past, and so he had to re-invent his world every few minutes to account for new events. As Sacks notes ‘If we wish to know about a man, we ask ‘what is his story – his real, inmost story? – for each of us is a biography, a story..[and a] singular narrative, which is constructed, continually, unconsciously, by, through, and in us – through our perceptions, our feelings, our thoughts, our actions..and our narratives…we must constantly recollect ourselves’. In both cases, we cannot define an object, be it a human, a table, or an electron by merely describing its properties at one instant in time. We can only define an object in terms of a process consisting of innumerable events, which create the story that defines it. This is very obvious when we are talking about humans, but it also applies to every object in the universe. In relativity, the history or ‘story’ of a process such as a football or a galaxy, consists of a series of events that are tied together by cause-and-effect to create the process that you see at any particular moment. These events include the interactions of one process with others that cumulatively create what you see as the history of the process at a particular moment. In relativity, we call this history of a process its worldline. 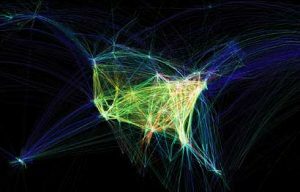 This is a worldline map (Credit Aaron Koblin / BBC)of airlines traveling to and from the United States. The lines give the history of each flight on the 2-d surface of Earth. Each worldline consists of a huge number of ‘hidden’ events contributed by each passenger! By carefully studying these worldlines you could mathematically deduce that Earth is a sphere. What Einstein said is that only worldlines matter, because that is the only thing we have access to. Even better than that, we are only able to see that part of a processes that can be communicated to us by using light, which is the fastest signal we can ever use to transfer information. When we are ‘looking’ at something, like a car or a star, what we are actually doing is looking back along its history carried to us as information traveling by photons of light. In an earlier essay, I mentioned how we do not see objects in space, but only the end points of a light ray’s history as, for example, it leaves the surface of an object (Event 1) arrives at dust mote along the way and was re-emitted (Event 2) to arrive at our retina, and cause a rod or a cone cell to fire (Event 3). Because these events are strictly determined by cause-and-effect, and travel times are limited by the speed of light, we can organize these events in a strict history for the object we viewed (which was in fact a ‘process’ in and of itself!). So, what does this say about space? Space is irrelevant, because we can completely define our story only in terms of the ‘geometry’ of these history worldlines and the causal connections between events on these worldlines, without any mention of space as a ‘background’ through which things move. This leads to another problem. Einstein’s new relativistic theory of gravity makes use of a convenient mathematical tool called 4-dimensional spacetime. Basically we live in a world with three dimensions of space and one dimension of time, making a 4-dimensional thing called spacetime. Without knowing, you live and work in 4-dimensions because there is nothing about you that does not ‘move’ in time as well as space from second to second. All physical process take place in 4 dimensions, so all theories of physics and how things work are necessarily statements about 4-dimensional things. It is common to refer to gravity as a curvature in the geometry of this spacetime ‘fabric’, but we can just as easily talk about the curvature of worldlines defining gravity and not even bother with the idea of spacetime at all! Remember, when you look at an object, you are ‘just’ looking back through its history revealed by the network of photons of light. In my next essay I will discuss why infinity is probably not a real concept in the physical world. Check back here on Friday, December 16 for the next installment! Physicist Lee Smolin’s book ‘The Three Roads to Quantum Gravity’ discusses many of these ideas in more detail. Previous PostIs Space Real?Next PostIs Infinity Real?